Get the latest market news and fuel perspectives. Learn what happened in Q1 and what to expect in Q2. Learn why customers are centralizing DEF procurement. Oil prices declined significantly this week, for the fourth week in a row. WTI crude prices dropped as low as $42.05/b on Wednesday, the lowest price since August 2016. WTI opened at $42.80/b today, up by $0.25, or 0.59%, above yesterday’s opening price. Prices have been steady overnight. WTI is currently $42.79/b, up by $0.05 from yesterday’s closing price. This week appears to be the fifth week in a row that oil prices will end in the red. WTI crude prices opened the week at $44.68/b. WTI opened this session at $42.80/b, a drop of $1.88, or 4.2%, from Monday’s opening. During the week, prices ranged from a low of $42.05/b on Wednesday to a high of $45.06/b on Monday, a range of $3.01. $42.82/b, up by $0.08 from yesterday’s closing price. WTI is currently $42.79/b, up by $0.05 from yesterday’s closing price. Diesel prices opened Monday at $1.4232/gallon. Diesel opened this morning at $1.3721/gallon, a significant drop of 5.11 cents, or 3.6% for the week. Prices ranged from a low of $1.354/gallon on Wednesday to a high of $1.4381/gallon on Monday, a price range of 8.41 cents. Current prices are $1.3665/gallon, down by 0.51 cents from yesterday’s closing price. Gasoline prices opened Monday at $1.4523/gallon. 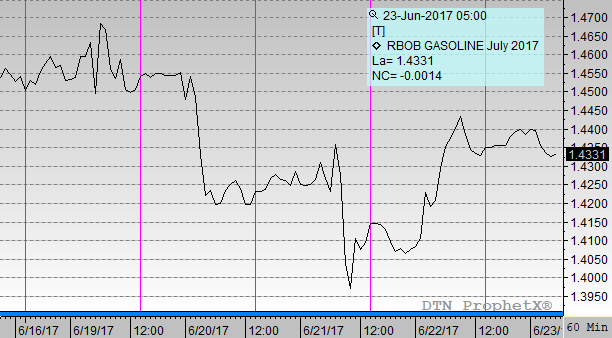 Gasoline opened today at $1.4369/gallon, a decline of 1.54 cents, or 1.1%, for the week. Prices ranged from a low of $1.3955/gallon on Wednesday to a high of $1.4716/gallon on Monday, a range of 7.61 cents. Prices are $1.4316/gallon currently, down by 0.29 cents from yesterday’s close. In the weeks since the OPEC-NOPEC meeting on May 25th, the market has been highly sensitive to changes in global and regional oil inventories. Although the meeting concluded with a successful agreement to extend the production cuts, the market consensus has been that a simple extension will take too long to drain inventories. In the U.S., the market has pounced upon the weekly release of the Energy Information Administration’s (EIA) supply and stocks data. Any evidence of continued oversupply seems to weaken prices. 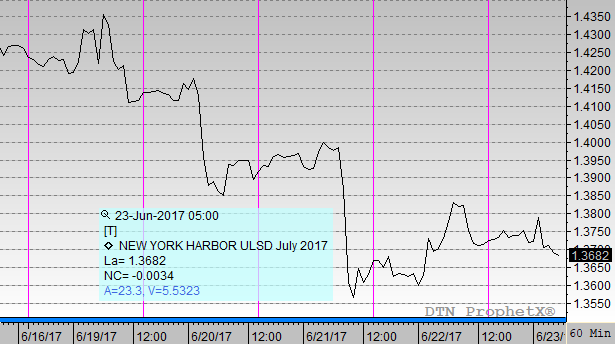 For the week ended June 9th, the EIA reported across-the-board additions to stockpiles and weak apparent demand, and a sell-off began. The supply data for this past week ended June 16th was far less bearish than in past weeks, showing crude and gasoline stock draws, plus a recovery in apparent gasoline demand. U.S. crude production, however, climbed by another 20 kbpd, even in light of the recent price declines. Some studies contend that crude prices will need to slide to around $40/b before U.S. production starts to shrink once again. The OPEC-NOPEC group participating in the production cuts has not agreed to cut any deeper into their own output. The group remains convinced that its existing agreement will be sufficient in the longer term, and some of the producers are unwilling to cut any further to avoid losing market share. UPDATED 04/18/19 - 11:48 a.m. The information contained herein is derived from sources believed to be reliable; however, this information is not guaranteed as to its accuracy or completeness. Furthermore, no responsibility is assumed for use of this material and no express or implied warranties or guarantees are made. This material and any view or comment expressed herein are provided for informational purposes only and should not be construed in any way as an inducement or recommendation to buy or sell products, commodity futures or options contracts. Copyright . Mansfield Energy Corp. All rights reserved. We are happy to discuss your business challenges over the phone and answer any questions. Ask your toughest questions. We'll get back to you with the best answer humanly possible. Need to contact a specfic office? View contact information for offices across the country. Let us know what type of fuel or service you need and a team member will get a quote to you quickly.